Fastrax, available through Glyn High-Tech Distribution has recently introduced the Fastrax IT520, the smallest GPS receiver in Fastrax’s IT500 series GPS modules. Fastrax is a pioneering supplier of high performance GPS receivers, GPS software solutions and GPS tracking systems for location-aware devices. Fastrax IT520 GPS receivers feature a form factor of only 0.4 x 14.0 x 2.3mm, allowing for easy utilisation in a variety of applications including asset tracking and navigation systems as well as battery-operated consumer products. Fastrax IT520 GPS receivers provide the same features and extremely high performance as the widely used Fastrax IT500 in an impressively miniature form factor. The new module takes 50 per cent less space than its predecessor, allowing for inclusion into tiny casings. With the optional built-in USB 2.0 interface, Fastrax IT520 GPS receivers are also ideally suited for GPS mouse and Mini PCI card applications. Taneli Tuurnala, CEO and President, Fastrax says that the small IT520 module was developed based on feedback from their customers. Trends indicate that GPS modules will be integrated into an increasing number of mobile phones, digital cameras, sports accessories and wristwatches. 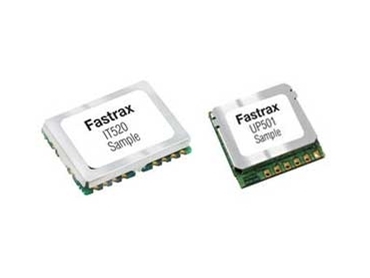 Additionally, Fastrax has introduced the Fastrax UP501 GPS module with an integrated antenna. The updated and improved version of the Fastrax UP500 is footprint and pin compatible with its predecessor. The module is now based on the same Mediatek MT3329 GPS chipset as the Fastrax IT520 and the Fastrax IT500 modules. All these modules have 66 acquisition channels and 22 tracking channels, and feature extraordinarily high -148dBm cold start sensitivity and -165dBm navigation sensitivity. The optimised performance enables navigation in even the most demanding applications and environments, ensuring a solid fix in harsh GPS visibility environments. Key to a smooth user experience in consumer applications, according to Taneli Tuurnala is fast and reliable operation as well as long battery life. This translates into a combination of high sensitivity, fast signal acquisition and low power consumption. Fastrax aims to continue providing the best possible GPS module offerings for these demanding environments and applications. The Fastrax UP501 is electrically and mechanically compatible with the Fastrax UP500, making upgrading easy for designers. The UP501 is also available with optional onboard battery back-up and RS232 connectivity.